Equip only to an "Evil Eye" monster. It cannot be targeted or destroyed by your opponent's card effects, or be destroyed by battle. 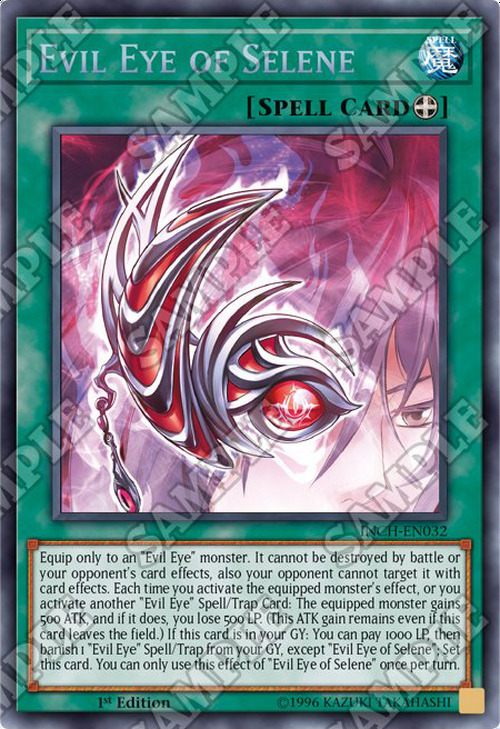 Each time the equipped monster's effect activates or another "Evil Eye" Spell/Trap card is activated, it gains 500 ATK and you take 500 damage. If this card is in your GY: You can pay 1000 LP and banish 1 other "Evil Eye" Spell/Trap Card from your GY; Set this card. You can only use this effect of "Evil Eye of Selene" once per turn.